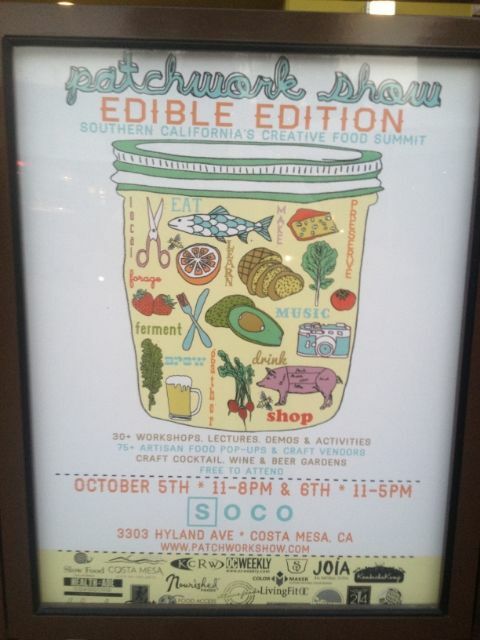 I recently attended a media preview for the Patchwork Edible show that is coming to SOCO in Costa Mesa on October 5th and 6th. Here is the official statement about the show. Orange County's Culinary Capital is hosting for the first-time ever the Patchwork Edible Edition for two days, Saturday, October 5 from 11 a.m.-8:00 p.m. and Sunday, October 6 from 11 a.m.-5 p.m. The two-day event will showcase the flourishing artisan food movement in SoCal through an interactive weekend filled with baking programs, food trucks, restaurant pop-ups, book signings, beer and wine gardens, samples and more! Come experience the latest offerings from some of the leading voices in the Southern California food movement including Evan Kleiman, Aida Mollenkamp, Russ Parsons, Gustavo Arellano, Bill Esparza, Christoper (CJ) Jacobsen, Dean Kim, Ernest Miller, and Laura Avery, and dozens of chefs, ranchers, farmers, bloggers and authors from across the region. 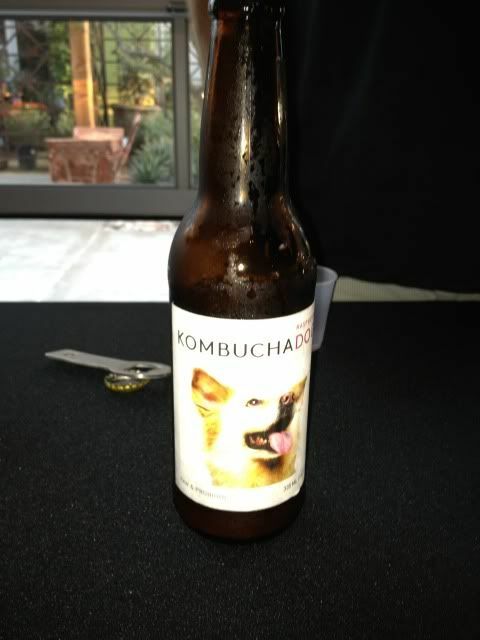 The Kombuchadog was very intriguing. It is a fermented tea loaded with anti-oxidants, detoxifying acids and probiotics which is really good for digestion. At first it was just bitter, but then it grew on you. They had raspberry and ginger. Definitely raspberry was my favorite. The ginger was made from fresh pressed Peruvian ginger. The alcohol content was slight at 0.7% so as their literature says ”the government does not allow us to say it is good for you”. The labels have pictures of dogs which actually depict real dogs that are in need to rescue. Very refreshing drink with a great story behind it. For the OC Mixes Cheese Shop there was only a sampling of their very extensive cheese and bread selection. All the food was good but the bread (see center in pic- 4 bread)stood out the most – very light and fluffy yet substantive. Also, the red pepper jam paired nicely with the bread, cheese and meats. The Japanese Ginger had a wonderful spicy kick to it. Almond Milk definitely has gained popularity and this was the right combination of milk with a slight almond taste, not to overpowering like many. It’s handmade from organic, raw and non-GMO ingredients. It’s also soy and gluten free. It was very smooth, rich and overall tasty. 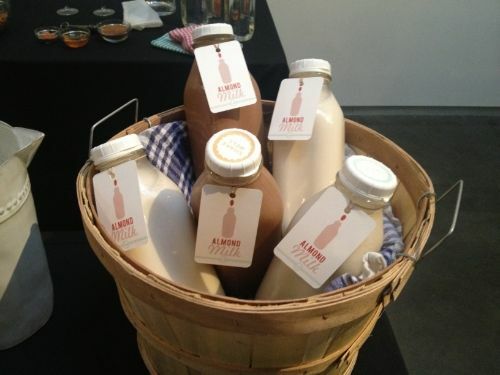 At the event there were samples of the Honey, Cacao and the pure milk. My favorite was just the pure one that was made of organic almonds and pink Himalayan sea salt. I almost walked by and didn’t stop at the Preservation Society because there was just an array of jars. I started talking with Ernest Miller, the master chef, and was duly impressed. He was very knowledgable about food preservation and their seasonal approach to making jars just makes sense - there is such a variety of differences depending on the time of year. Products we discussed were relishes, preserves, pickles and marmalades. Plus, he was working on a sauerkraut made of red cabbage that turned out excellent. There was an wide array of bread sample by Bread Artisan Bread and they all were consistently fresh, crunchy outside and chewy inside. Very much like good quality bread you would find in Europe. Onotria was a hidden gem that I will definitely need to seek out to dine in the future. The owner was there making two kinds of mozzarella cheese from scratch, burrata and regular. 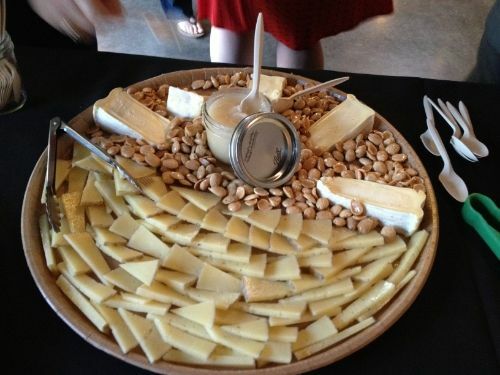 We had a fascinating conversation about cheese and how different it is in Italy vs America. Both cheeses you had to work and play with in your mouth, chewing slowly to really appreciate the work that went into making them as he demonstrated. The burrata was served on passion fruit and more subtle to the palette where the regular mozzarella was just there waiting to be chewed, savored and appreciated. The YES Bar caught my attention because Abigail was so passionate about what she did and I had to try these. So, these tasty little morsels are free of dairy, gluten, and soy. I tried the coffee cayenne and macadamia chocolate chip. Both were chewy and crunchy at once with bursting flavors. Definitely worth a try for anyone with food allergies. Taco Maria served up some seriously good corn and the home made chips were enough to get me to come back and try the restaurant. The chips were fried to perfection and heavy, I had no fear of them breaking when scooping up large gobs of guacamole that they served. They just opened a full sit down restaurant there at the Soco mart area. Greenleaf Gourmet chopshop served up delightful morsels of flavor and the peaches with cream hit the spot. Front Porch Pops showcased some new items venturing into pies and pretzel bites. The pretzel came with several kinds of dipping sauces, all worth trying. My favorite from their table though was the cutely packaged up pie cubes – yummy and easy to eat. To celebrate the annual Hatch Chile-Fest in New Mexico, Z'Tejas in South Coast Plaza is having their own version of Chile-Fest with a special, very limited-time menu that features all sorts of dishes with Hatch chiles. The special Chile-Fest menu runs from September 3rd to September 16th, 2013. $1 from each entree sold off of the special menu will benefit the Blind Children's Learning Center. The menu selection includes items from every category from cocktails, to appetizers, to entrees and desserts. I was luck enough to be invited down to sample some of the special chile items. I started my night off with the Smokin' Margarita ($8.50) cocktail. I am a huge fan of margaritas, and I really love spicy stuff, so I thought this drink would be perfect. The drink is made with Herradura Anejo tequila, DeKuyper Peach, GRand Marnier, fresh lemon juice and what they call a "special kick." Well this "special kick" really was a "KICK!" The drink has a very potent, spicy sting that leaves your lips a little numb. Next us was the appetizer of Fried Hatch Chiles and Onions ($6.95). Thin strips of Hatch chiles and onions were battered and fried to a crispy, golden-brown. The strings were served with a side of ranch dressing and BBQ sauce. I really enjoyed this dish, but really wished that there were more Hatch chiles. The dish consisted of about 80%-90% onions, and only a few strips of chile here and there. Next up were the entrees. V ordered the Adobo Steak Relleno ($13.95) and I went for the Herb Chile Glazed Mahi Mahi ($16.95). V's Steak Relleno consisted of roasted Hatch chiles stuffed with seared beef tenderloin, jack cheese and caramelized onions. They were topped with a chipotle corn relish and server with Hatch chile rice and spicy red beans. V and I both agreed that this dish was very good, but we both wished it had more steak, as there were only around four tiny cubes of steak in the entire dish. The Herb Chile Glazed Mahi Mahi was served with roasted vegetables, spicy red beans, Hatch chile rice and some small corn tortillas, so you could make your own fish tacos. This was also good, but I felt that it could have used more Hatch chiles. The plate was also served with a cool, creamy slaw that V enjoyed very much. To finish off the night, we had a Hatch Chile Coconut Flan ($5.95). This cool and creamy dessert was absolutely perfect and my favorite dish of the night. The sweet custard flan was spiked with a nice punch of chile pepper that you could feel in the back of your throat. The more I ate of it, the more I liked it. It may sound a little weird to have chile peppers in your dessert, but trust me, it works. This special menu only lasts for less than two weeks, so get it while you can. This does seem to be an annual even t for Z'Tejas though, so if you miss it this year, make sure to mark your calendar for next time!